Dragonfire Standard Strat Singles offer a solid upgrade to your Squier or import pickups at a great price. 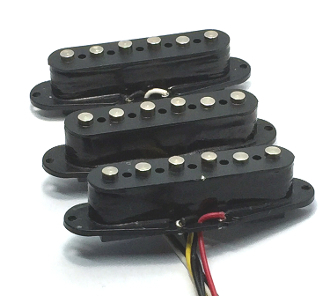 The Ceramic magnets featured in these pickups provide clean, modern tone. These are dedicated position pickups so these are not position interchangeable. The Middle position pickup is Reverse-Wound and Reverse-Polarity (RWRP) to give you hum-cancelling in Positions 2 & 4. 250K pots and 0.022 or 0.047 tone caps (available separately) are recommended for use with these pickups. These are 2-wire pickups that come with a colored hot (each position has a different color) and a black ground wire for easy installation.